Weekly planner offers coastal scenes on every page. Each scene is subtly ghosted for legible notes. 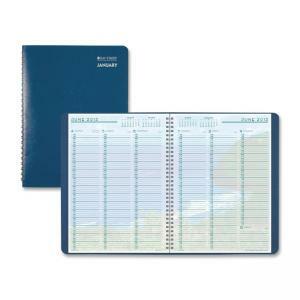 Wirebound planner lies flat for easy writing. Planning pages range 12 months from January to December. Each two-page-per-week spread includes ruled daily columns, quarter-hourly appointment times from 7 AM to 10 PM on weekdays and to 6 PM on Saturdays, Monday through Sunday scheduling, holidays, and past, current and two future months reference. Planner includes address/phone pages; reference pages with conversions, national holidays and world time zones; a vinyl storage pocket in back for added paper storage; and flexible leatherlike cover. Planner also includes a free "Plan for Success" webinar. Pages are printed on paper made with 90 percent recycled material and 30 percent post-consumer material.